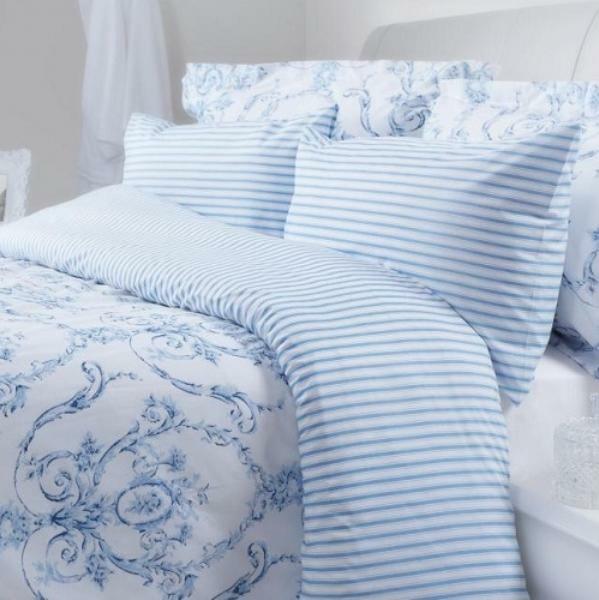 This classic blue on white duvet cover has a delicately pretty Toile de Jouy design depicting floral patterns, and a classic blue stripe on white reverse, bringing a fresh yet traditional feel to your bedrooms. Beautifully constructed exclusively for Out of Eden in Portugal from 180 thread count 50/50 poly cotton, the duvet covers are made with wide shoulders, to make changing faster and easier. I am so pleased with the items I ordered. The quality is superb, they wash and iron well and look marvellous in the room. Excellent service and friendly staff whom it is a pleasure to do business with. Thank you.